This beautiful and fascinating topographical chart depicts Grand Teton National Park in Wyoming. 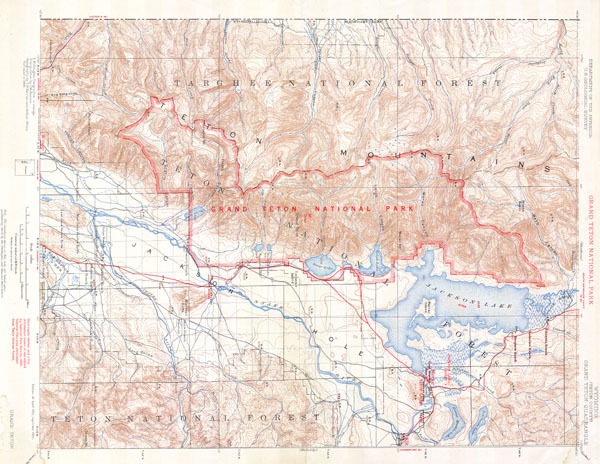 This map was made shortly after Grand Teton National Park was established in 1929. The park's main attraction are its stunning U shaped valleys at the foot fo the towering Teton Range – part of the Rockies. The park is named for Grand Teton, the largest mountain in the range at a 4197 meters. Today Grand Teton, just south of Yellowstone, is one of America's most beautiful National Parks.